I really appreciated the narrative choices and gorgeous artwork in this graphic adaptation of the Frankenstein story, though the story itself was occasionally a bit rushed and therefore hard to follow. The central character of the scientist mom was really well developed including solid connections to both #blacklivesmatter and #metoo. Her son was killed by a police officer while coming home from a little league game and though she was able to use her skills in nanotechnology to bring him back him in a form, she had to keep her accomplishments and anger hidden in order to function in society. But when the original monster created by Dr. Frankenstein returns to seek vengeance she also finds an outlet for her rage. 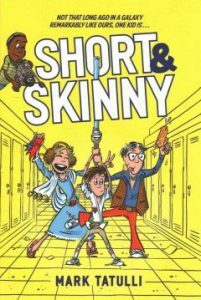 Middle school life is not so easy when you are short and skinny and a default target of the neighborhood bullies and this terrific graphic memoir captures it all. This genre is really booming lately and I appreciate it. I loved reading about young Mark’s adoration of his bicycle, his feeling of belonging upon seeing Star Wars, and watching him make that epic movie! Plus his bully notes and dread of summer swim team were so spot on. Great comics and a wonderful capture of the time. 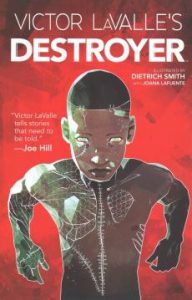 You can find this book in our Middle Grade graphic novel section. This was a sweet and classic Kate DiCamillo work. 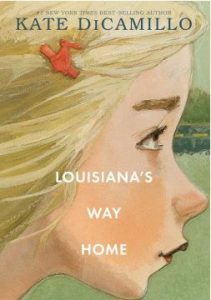 Of course I loved the plucky main character Louisiana and her backstory had some good shock value. Burke Allen was a precious companion and the array of crazy adult characters were all well-realized and certainly individuals. If you are looking for a well-written middle grade novel then Kate DiCamillo works are always a stellar choice. This one is in the Middle Grade Realistic section. This is the perfectly mastered story of a California youth who leaves the sunshine behind and lands at a New England college studying classics with a exclusive group of privileged students. The book is full of atmosphere and mystery and the full depths of the secrets alluded to by the title are slowly meted out to the reader. Connections to the Great Gatsby abound as well as to the classic philosophies that the students are reading. A dark and engrossing novel that will really stay with you. This book can be found in the Literature section along with many other terrific works. 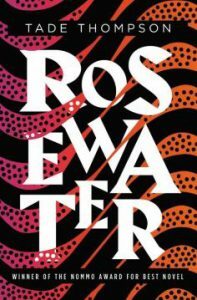 Rosewater is totally engrossing and stunning sci-fi work from Nigerian writer Tade Thompson. The world has changed significantly following the first successful extraterrestrial landing in England. The ship and the life on it seemed to disappear into the ground at Hyde Park but in other places in the world strange transformations have taken place such as the biodome in Nigeria which provides energy to Rosewood, the circular city that surrounds it. Some people have acquired or been born with transformations too such as Kaaro who can follow people’s thoughts by accessing the psychic energy connecting the new world, the xenosphere. A reformed thief, Kaaro now works for the government as an interrogator and investigator. Both current and past mysteries are revealed as we navigate this new world through Kaaro’s narrative. An absolutely charming middle grade realistic fiction that hopefully gets some Newbery love in January. 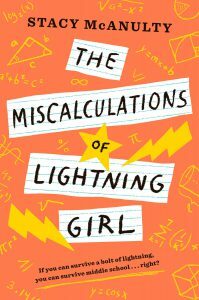 When Lucy was 8 years-old the metal fence that she was climbing on was struck by lightning and the jolt has left her with some OCD mannerisms but also with a very strongly developed sense of numbers and math. After the accident Lucy’s primary caregiver, her grandmother, home-schooled her for some time but at the beginning of the story she is determined to send her to middle school for some time with her peers. Lucy’s compulsions don’t go over very well with most of the other 7th graders but a couple of people are able to see past them. This is a story with a lot of heart about friendship, trust, family, the beauty of numbers and one very sweet shelter dog whose narrative caused some (slightly) tear-stained pages in this library book. Short and precious and so well-made down to the sepia-toned illustrations inside and the tiny golden stars on the book cover. 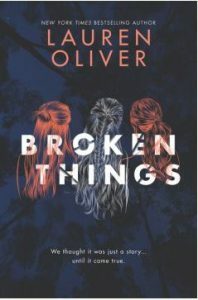 When ten-year-old Livy returns to Australia to see her grandmother after a gap of five years, everyone is disappointed by how little she remembers from her previous visit. She is frustrated too especially as she has the sense that something very important has been left undone from her past. 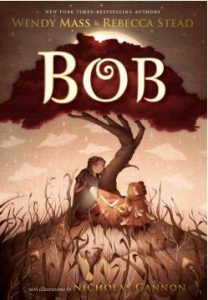 This all changes when she opens her closet door and is reunited with Bob, a special friend and mysterious creature who has been waiting all of these years for her return. The sense of the beauty, power and mystery of memory makes this tiny fantasy a real treat. Five years ago Brynn and Mia’s friend Summer was found dead in the woods with multiple stab wounds. In a whirlwind trial they quickly become the prime suspects though the case was thrown out of court without a verdict. When Brynn is sent home from rehab, her path crosses Mia’s again and they slowly begin to puzzle through some of the lingering mysteries around Summer’s death and the fairy tale world that tied them together. 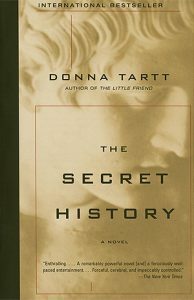 You can find this book and similar ones in our very popular THRILLERS section. Ask any library staff member to point the way. 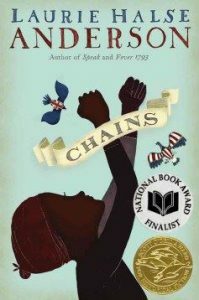 Chains is the first book in Laurie Halse Anderson’s “Seeds of America” series though it works quite well as a stand-alone read too. The story begins in New England in the late 1700s when slavery was still legal through all of the English colonies though it was losing favor. Isabel and her little sister have been promised their freedom by their owner but after her death her nephew quickly disposes of the paperwork and sells them to a husband and wife who live in New York city and who are loyal to the English king. Isabel is a very industrious and clever character but for the most part she is trapped by societal rules for African Americans. Still one path of resistance presents itself – she can become a spy for the American revolutionaries. Isabel’s life makes an excellent lens to explore both slavery and the early years on the American revolution. We look forward to hosting Laurie Halse Anderson at our school December 2019. She has written many excellent books for teens as well as this Middle Grade historical series. 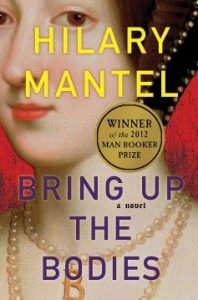 Bringing Up the Bodies is part two of Hilary Mantel’s study of the life of Sir Thomas Cromwell, a key political and financial advisor to Henry VIII. Part I, Wolf Hall, won the Booker prize for literature and this one actually did too. If you are looking for a well-written and insightful look into the life of the great king and his wives – and of a commoner who rose to amazing heights then this is your writer. Both books are in the secondary Historical Fiction section. Enter your email address to subscribe to the AAS Library Blog and receive notifications of new posts by email.